A short background paragraph, I wanted a board with less fin length to use in my granite rock strewn lake in Maine. I had the option of spending big bucks on a ready made twin , or find a donor board to cut up. If you have followed any of my previous winter projects you know which path I have taken. 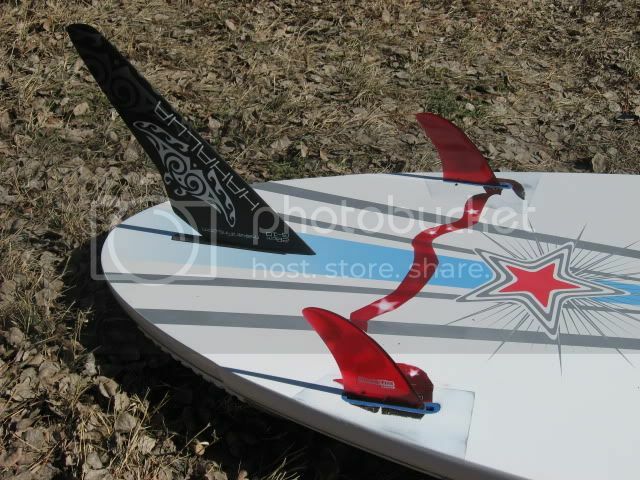 the board is a 2011 TABOU Rocket 135L. I made a decision to do a 2+ 1 instead of twin based mostly on the fins I already have. To do this as a twin I would use slot boxes , and I would need a pair of large slot box twins . Since I have a huge arsenal of side bites and the weight gain would be minimal using my tried TRUE and tested ProBox, it was a 2+1 that won out. The placement of the boxes is typical 2 + 1, instead of thruster placement, so further forward from the tail. This should present a firm ride with drawn out speedy turns. The intent IN the first photo, large center and small sides. As a option it can/should/ hopefully should be a little more turny in the fin set up in photo 2, which is larger sides and smaller center. So that will mitigate the 2+ 1 setup, some, and of course part of the fun is to see which works best, or put another way, which I like best. It may very well be a compromise of size that makes the most pleasing overall ride. I did not want or expect to change to character of this semi large free ride board by this addition, or fin change.The sole intend was to have fins that didn't luv the rocks so much. This was an easy project, I only added the red ribbon as a graphic. for the geeks there: the toe is 1.98 degrees toward the nose, the 2nd photo have custom G10s, with a very sophisticated inside 70/30 foil , all the sides fins are ProBox fins. Breaking water will be OBX in April, anyone is welcome to try it. I'd reco the G-10 side biters. Softpoly clear cheaps tend to spin out and never regrab. I think tris, you need more total fin area than a big single blade. for a 2+1 or tri fin the area should be 1.33--1.5 times greater than the single fin. it depends quite a lot on the fin shape for the area. I would have thought that a bit on the small side..what size sails do you use ? The 11in handles my 7.2 Ezzy Infinity very nicely, also my 6.5 Infinity. I have the same fin in 10in which I use with my 5.2 Ezzy Wave SE. I sort of bought into the theory that multi fins produce more drag and that it was more important to find a well shaped single fin. Fins are a such a huge debate, I have 15 yr old tuttle weed(the blue ones) that still work well. I've gotten so used to the Wardog/SurfGrass I use them even when there are no weeds. Up wind,manuverability/speed are more than adequit for my sailing needs. I chose the weed fin because it has a shorter draft length , so less depth to encounter rocks. I use weed fins when I have to, otherwise I find they turning ability lacking, several exceptions and shapes come closer to a regular fin. my multi fin philosophy is that they will increase drag, but the other positive characteristics more than off set that, and if you like or need upwind capability then a good tri fin will really make you smile. 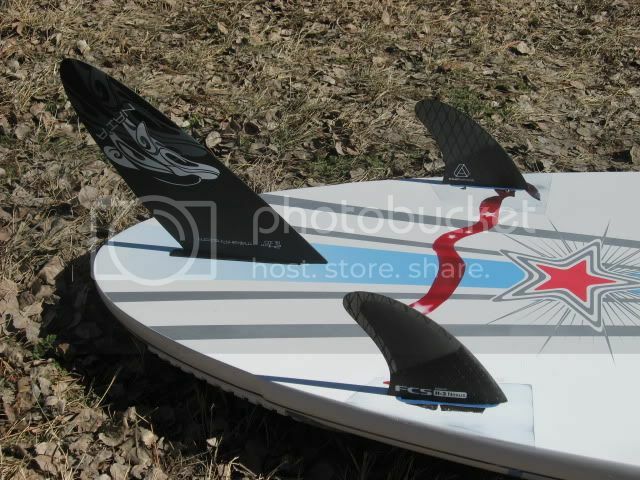 This board was NOT about multi fin , but rather a solution to a performance board want/need with a shorter fin depth. It's always best to keep those expensive fins off the rocks. I had a board back in the early 80's with a tri fin set up, but back then they were poly cabonate and twisted something fierce inducing massive spinout. I'm sure your having fun expermenting, especially with lots of spare bits n' pieces laying around on long cold winter days. 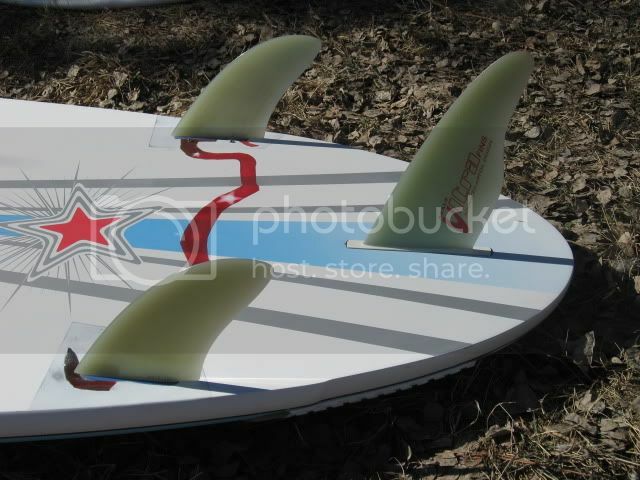 I find that the short.. 4.5" fins are fine in fiberglass, so as sidebites their application is OK, some flex may be of benefit, depending on the fin setup/board, not so I think on this one. Their are some fins that are a lessor grade of plastic, and those I can see being on the bendy side , translates into you get what you pay for. and high tech foils. Worked well on my AmiGiu conversion. So, for example, it's blowin 20 or so south west at the hole in Avon. You take a run or two with a single fin and then ad the side fin, what does one set up vs. thr other do for you?